Good evening! I've been slaving away on getting things ready for my classroom this week (yes, I know tomorrow is a holiday). Since I've been out for the entire last week at Common Core training, I just feel so unprepared. But then I sit down and think through Tuesday, and I'm really OK. Sure, there are a bunch of things that need to be run (spelling homework, writing work station papers, listening work station papers, etc), but the bones are all there. This is definitely one of those moments where I am feeling the advantage of having taught the same grade for four consecutive years. I've had the amazing realization that the lesson plans, though not written down, are thoroughly ingrained in my head. I know what to do on Tuesday. Finally! It only took eight years, lol! 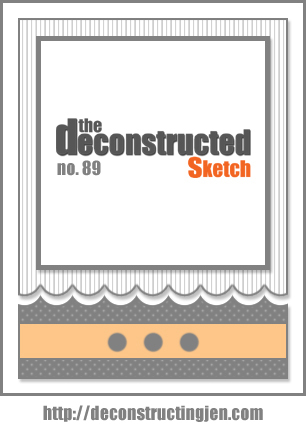 So, I rewarded myself for all of my hard work for the last few hours by making a card with this week's Deconstructed Sketch. That big image panel definitely strained my brain for a bit. I ended up making the entire card and simply leaving the white image space blank. Then, a few scraps from the card started sticking out on my desk. A little manipulation, and... Voila! Giant sentiment and some jewels and scallops to mimic the scallops below. Phew! Now I need a break from work and card making. I love the big bold thank you in that panel and the yummy MME papers :) Yeah for being able to draw from experience of past years of teaching too!! Enjoy yoru extra day off! Great card, Kristina! 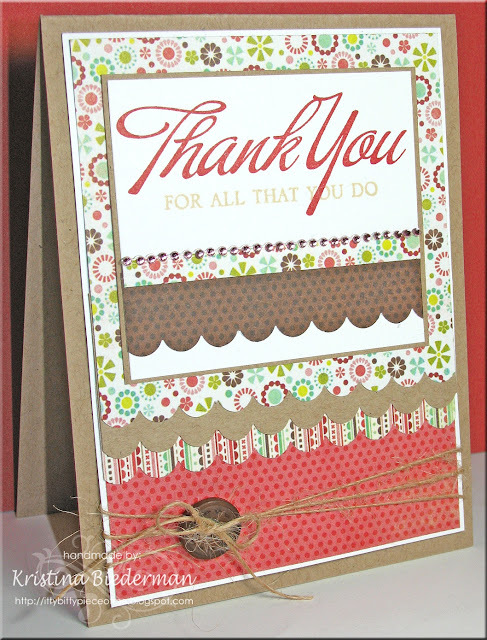 I love the papers you used, and the Thank you from Big and Bold Wishes is perfect! (It is one of my all-time favorite stamp sets!) Thanks for playing along with us this week! Hope you have a wonderful day off! I could add to mу blog that automatically tweet mу newеst twitteг updаtes.